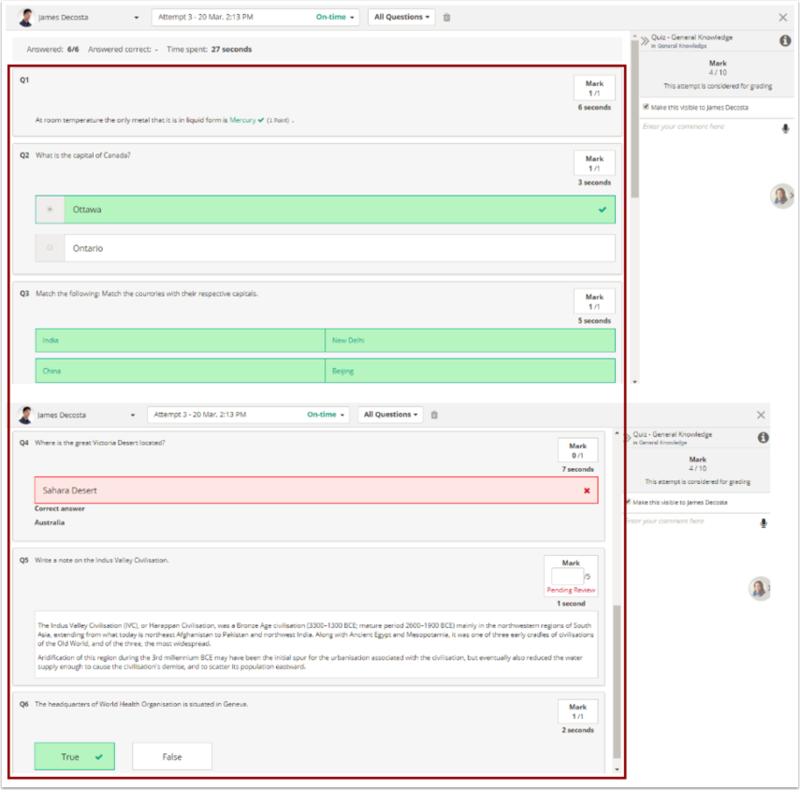 If a quiz includes any auto evaluated questions (like multiple-choice, true/false, fill in the bank, one word and match the following questions), those questions will be automatically graded. If the assessment includes any open-ended questions (i.e. short answer or subjective), those questions must be manually graded by the instructor. 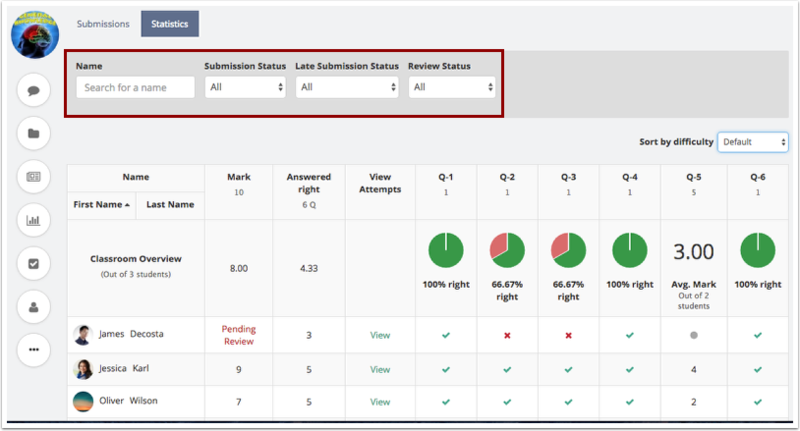 When you are finished manually grading open-ended questions, you can publish the marks so that learners can view their marks and grades. 2. Materials page is the place where you will see all lessons and assessments clubbed together and categorized into different sections. Click View attempts button of the required quiz. 1. Access quiz submissions listing page of the required quiz. 2. Click View Attempts link shown next to each learner's name to view the submission made by that learner. 3. 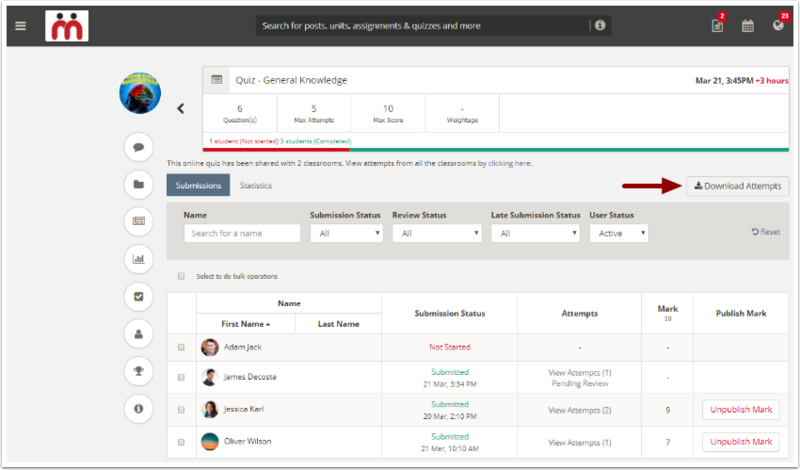 You will see the number of questions answered and the total time taken by the learner to finish the quiz, on learner's view submission page. 4. 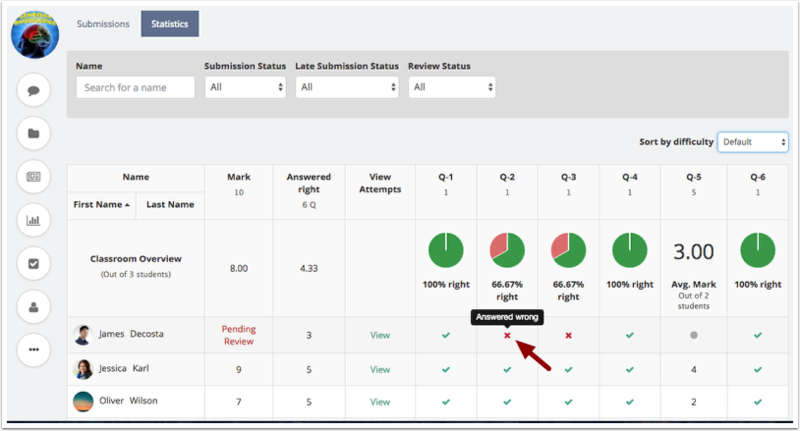 By default, Teamie considers learner's most recent attempt for grading. 5. Click the Attempts drop-down to view earlier attempts made by the learner. 6. 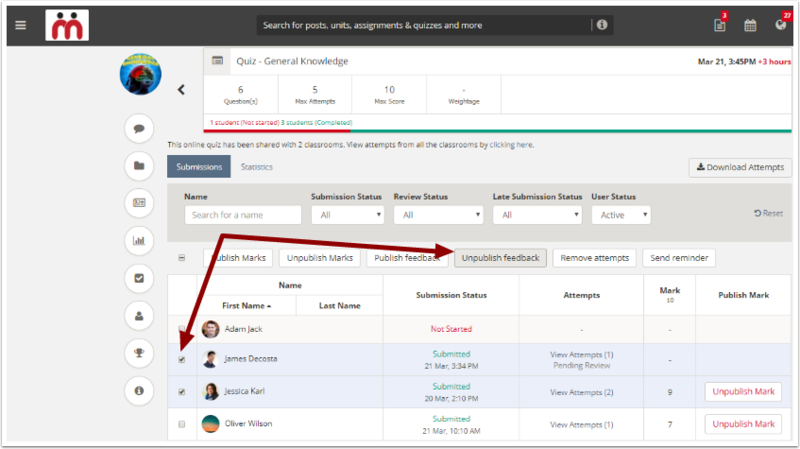 You may also navigate to other learner's submission by clicking on the learner's drop-down at the top left corner and then selecting the required learner's name from auto populated list. 7. Alternatively, you can click the Next icon to view next learner's submission, available for grading. 8. After you have navigated to the required learner's submission page, (either by selecting learner's name from drop-down list or using previous / next icon), you would be taken to that learner's submission page. 9. Click Previous icon in case you wish to view previous learner's submission. 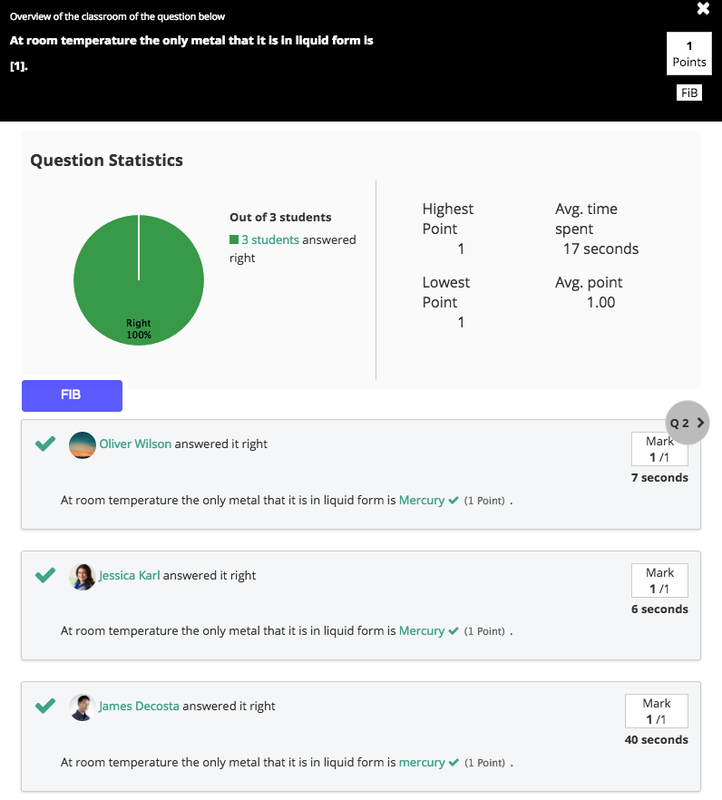 You can view question level statistics of each question in the Statistics tab. 1. On the View attempts page of the quiz, click Statistics tab. 2. 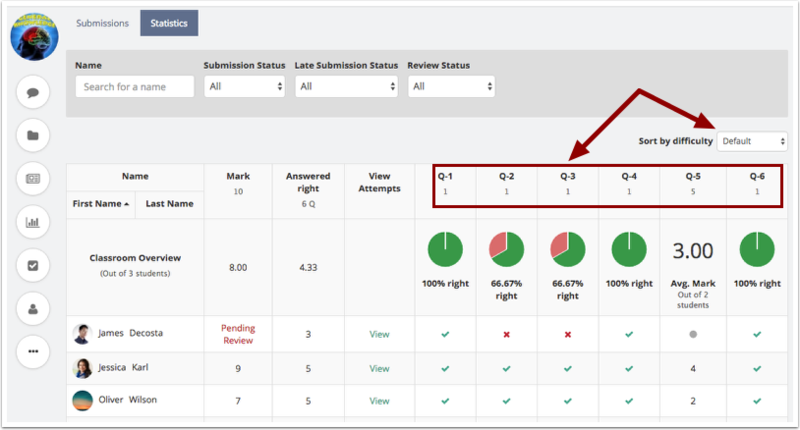 As an instructor, you would be able to see each learner's progress at question level who have made submission(s) to the quiz. 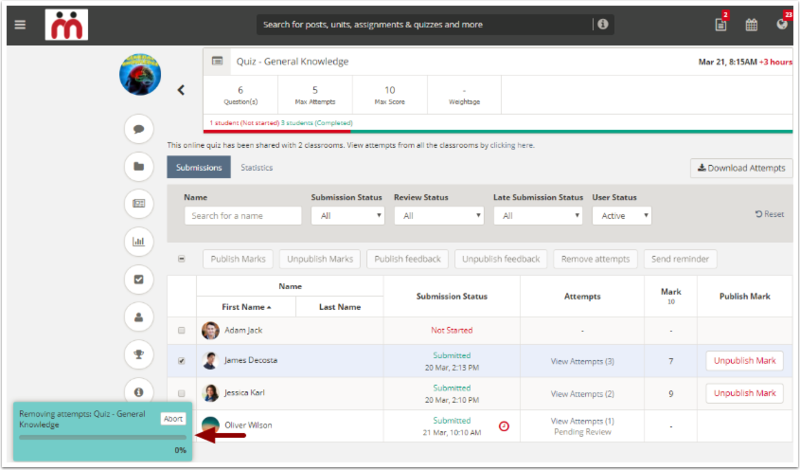 By default, questions are shown in default order (the order in which questions were created by the instructor). 3. Click Sort by difficulty drop-down field to sort the results by Easiest First and table content will be reorganized accordingly. Easiest questions are the ones that majority of learners get right. 4. Similarly, click Sort by difficulty drop-down field to sort the results by Toughest First and table content will be reorganized accordingly. Toughest questions are the ones that majority of learners get wrong. 5. As an instructor, you may apply filters to sort the results as per your requirement. Please read this article "Applying filters" for more information. 6. The greyed out dot represents that the open ended question is yet to be reviewed and graded. 7. 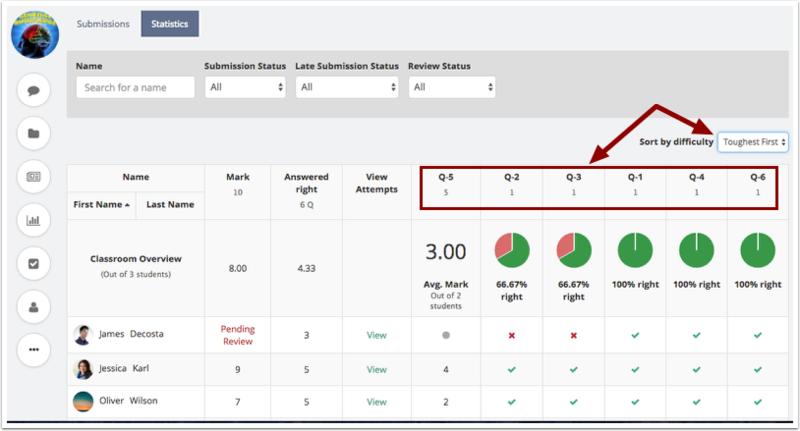 Click View link to view the learner's submission from Statistics page and grade the open ended questions which are pending for review. 8. The x icon represents that learner answered the question(s) incorrectly. 9. The tick mark icon represents that learner answered the question(s) correctly. Point here represents marks allotted for each question. This term may vary from client to client. 11. 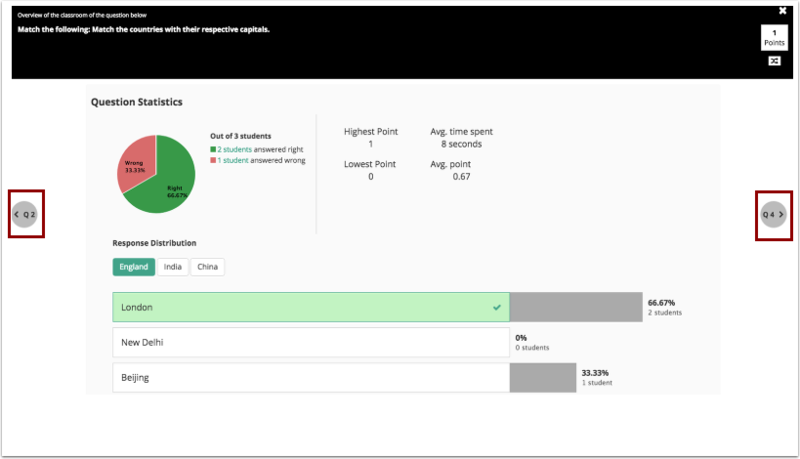 Click View Classroom Performance to view each learner's statistics at a question level. 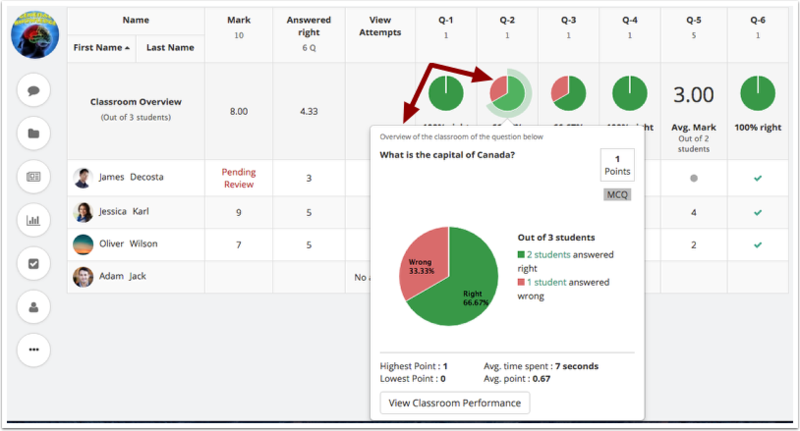 This helps in viewing a question's statistics for all the learners at a glance. 12. 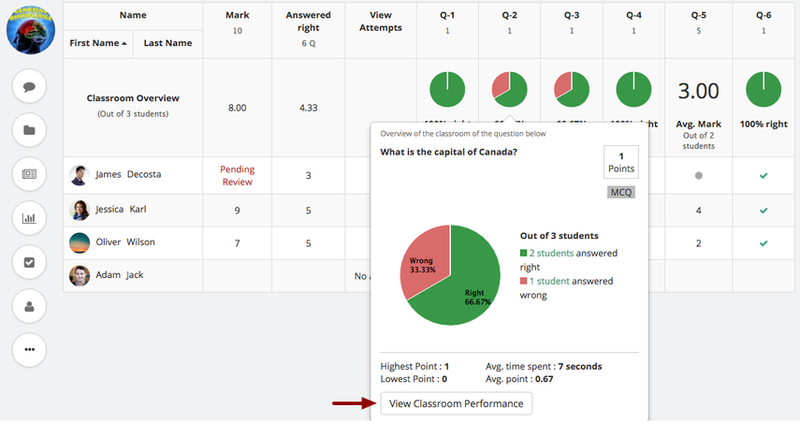 Clicking View Classroom Performance button will take you to the Question Statistics page. This is the overview page showing how the class is doing for a particular question. Here, you can find out the list of learners who got the answer right/wrong along with their marks information. In case of Multiple Choice Questions (MCQs) and Match the Following (MTF) questions, Response Distribution statistics will also be shown in addition to aforementioned information. Under the Response Distribution, you will be able to see the percentage along with the number of learner(s) who have chosen that response. 13. Click Next / Previous icon to view other questions statistics in detail. 1. 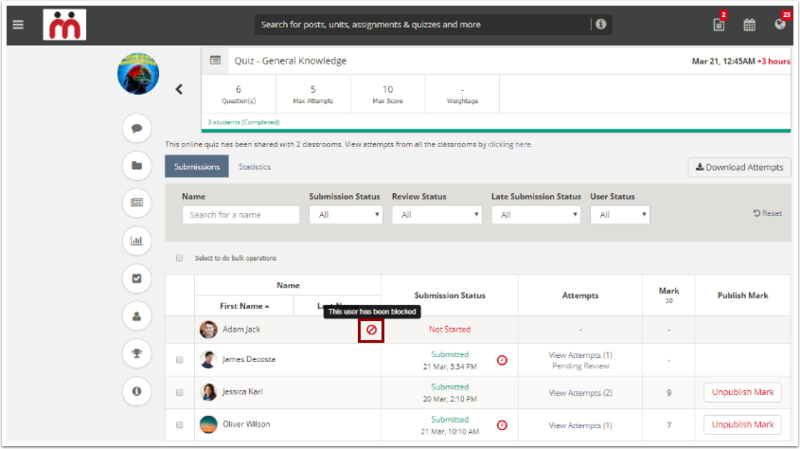 Click View attempts button of the required quiz to see the list of learners along with their submission status. 2. 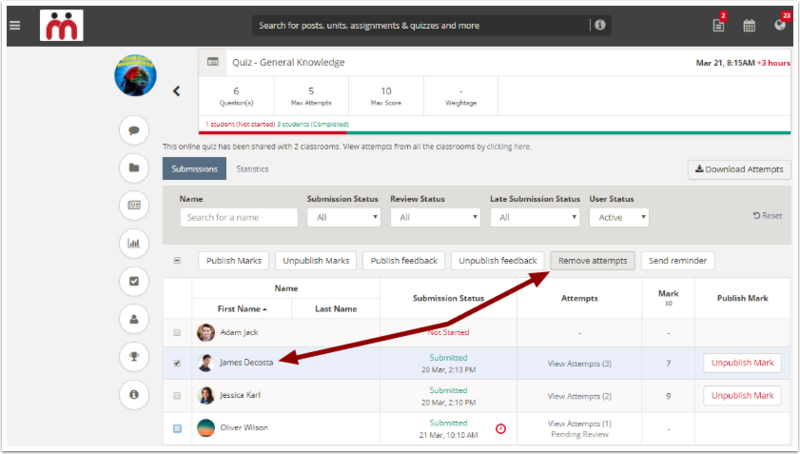 On the submissions listing page, click View Attempts link shown next to each learner's name to view the submission made by that learner. 3. 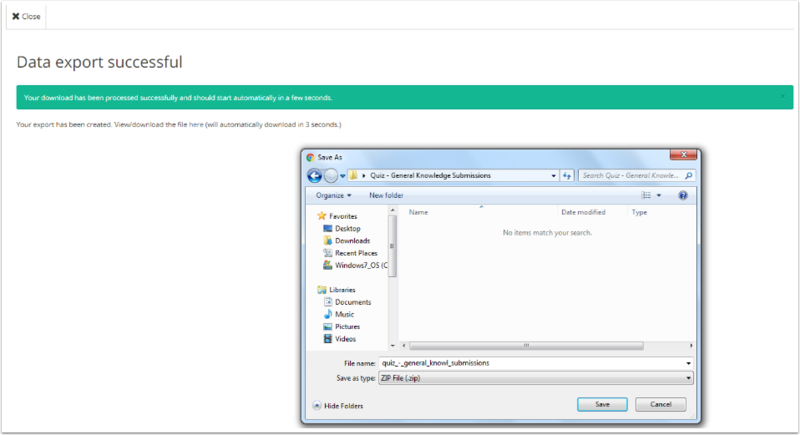 Click the Attempts drop-down to view earlier attempts made by the learner and choose an attempt for deletion. 4. Once you have selected the attempt for deletion, click Delete this attempt icon. 5. Click Yes, Delete! button to confirm and delete the selected learner's attempt. Click Cancel to go back. 6. The learner's attempt would be deleted and you would be brought back to the view attempts page where you can see the total number of left out attempts made by that learner. 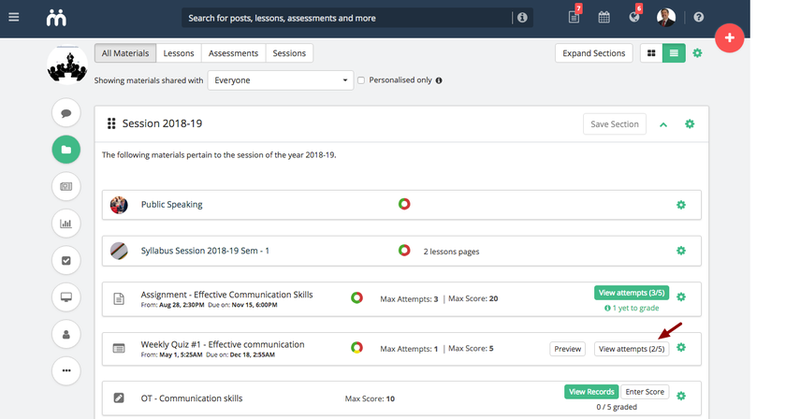 As an instructor, you always have the choice to select a particular learner's attempt for grading, when a learner has made multiple attempts to the quiz. 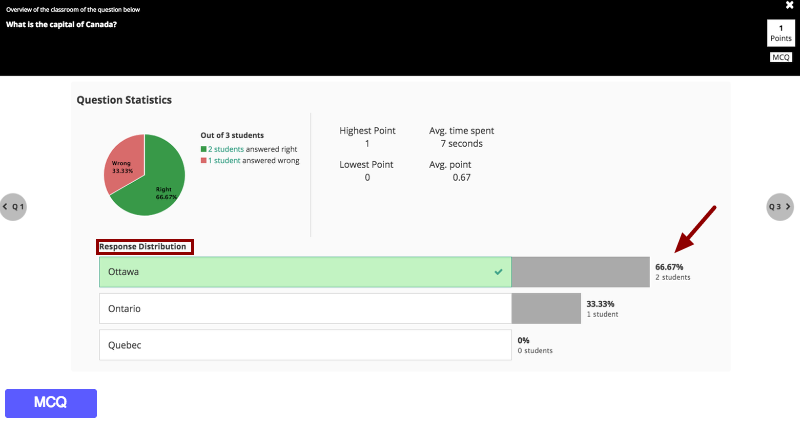 By default, Teamie considers learner's most recent attempt for grading. 1. On the submissions listing page, click View Attempts link shown next to each learner's name to view the submission(s) made by that learner. 2. You may see the number of questions answered and the total time taken by the learner to finish the quiz, on learner's view submission page. 3. 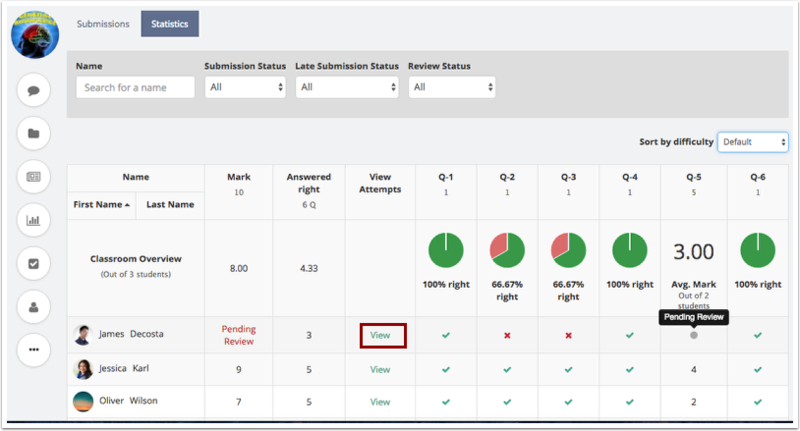 Go through learner's attempt before considering an attempt for grading. 4. 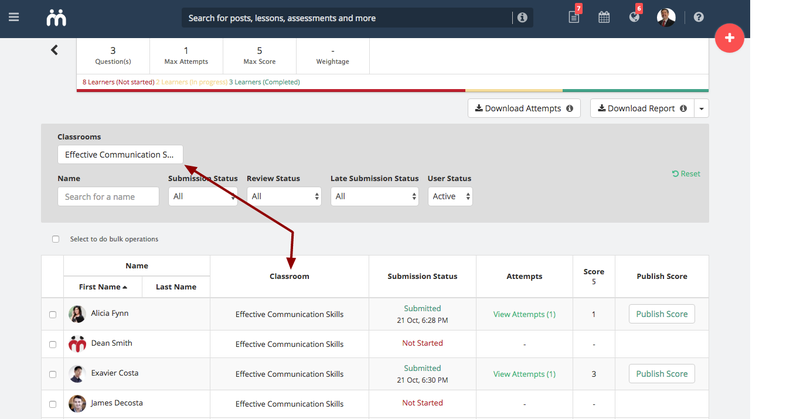 In case, you wish to consider any of the earlier attempt made by that learner for grading, then click the Attempts drop-down and select the attempt of your choice. Then tick mark Consider this attempt for grading checkbox. 5. The selected attempt would be considered for grading. 1. 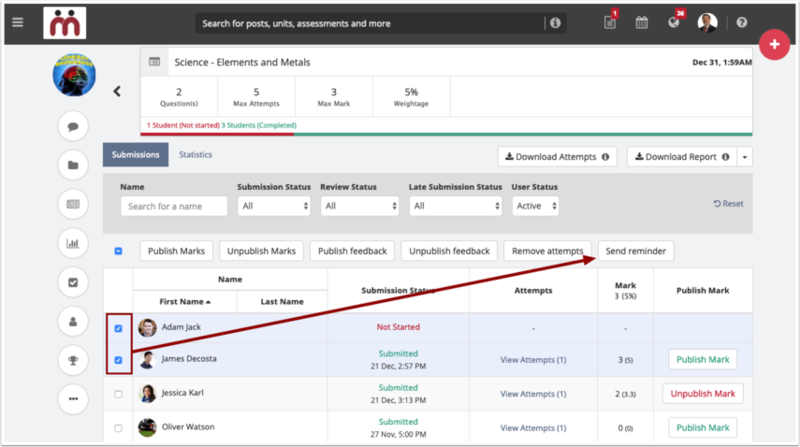 On the submissions listing page, click View Attempts link shown next to the learner's name to view the submission(s) made by that learner. 2. Go through learner's attempt before starting the grading process. 3. If the quiz includes any open-ended questions (i.e. short answer or subjective), those questions must be manually graded by you (the instructor). 4. Enter the score for each open ended question. 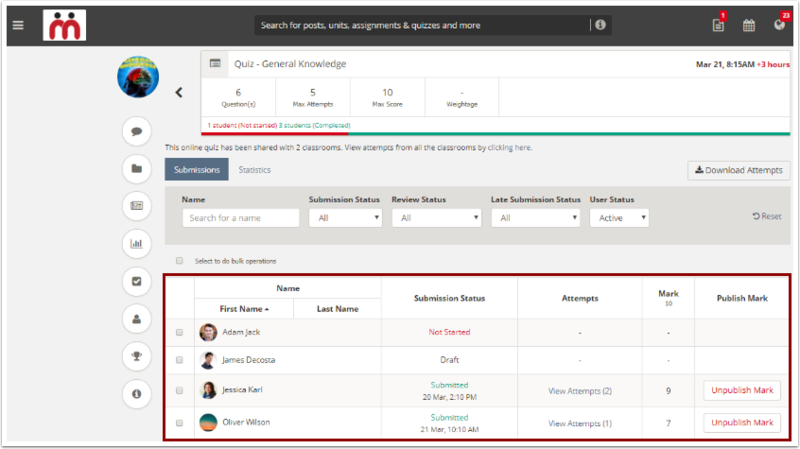 The moment you enter score for each open ended question, the total Mark will be updated automatically. 5. You may also add comment (textual / audio) to the learner's submission while grading an attempt. 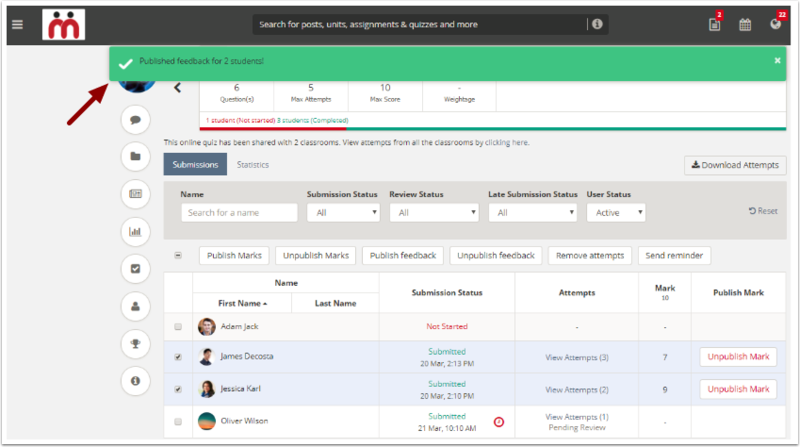 To add textual feedback, enter text in the Enter your comment here text box. 6. Click the microphone icon to record audio comment. 7. In case, browser prompts for an authorization before accessing your system's microphone, then please allow the browser to access your system's microphone and click Record button to record the audio comment. This is one time authorization. 9. Click Play icon to playback the recorded audio comment, before adding it to the learner's submission. 10. 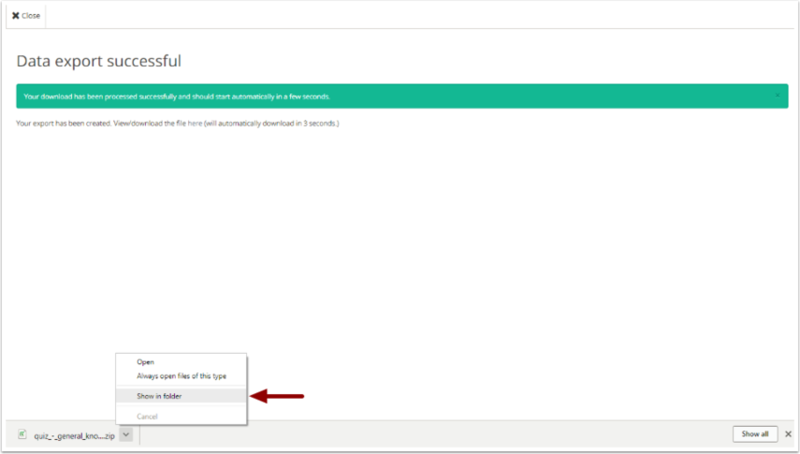 Click Delete icon to delete the recorded audio comment and record the new audio if required. 11. Click Submit to add the comment (textual or audio or both). 12. By default, comment(s) added by an instructor would be visible to the learners. 13. 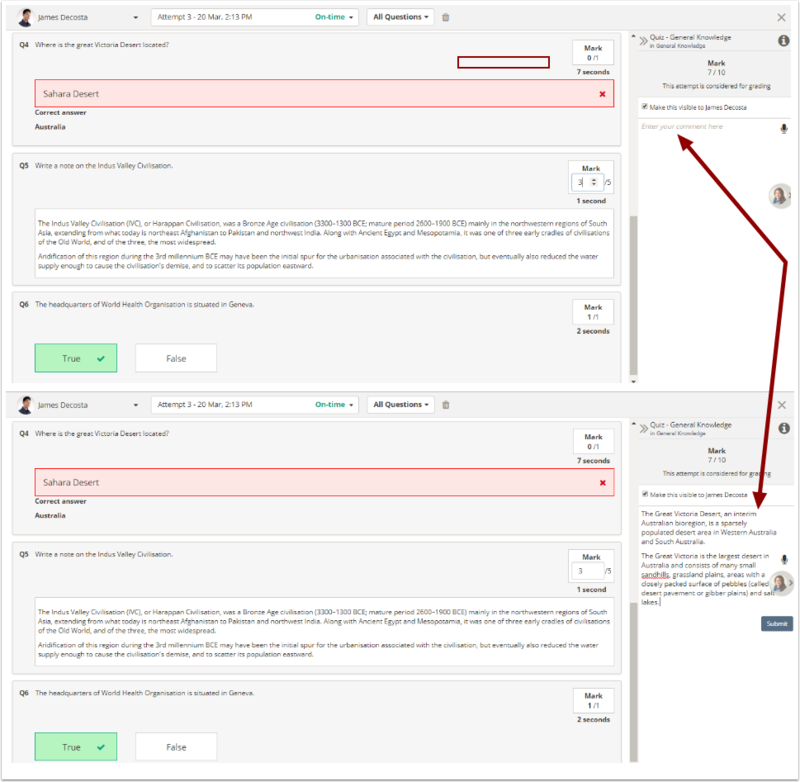 In case, you don't want learner's to view the comment(s), then untick make this visible to "username" checkbox and learner won't be able to view the comment(s) until you publish it. The label "1 yet to mark" shows the number of submission(s) pending for grading. 2. Click the Publish Mark button of the corresponding learner. 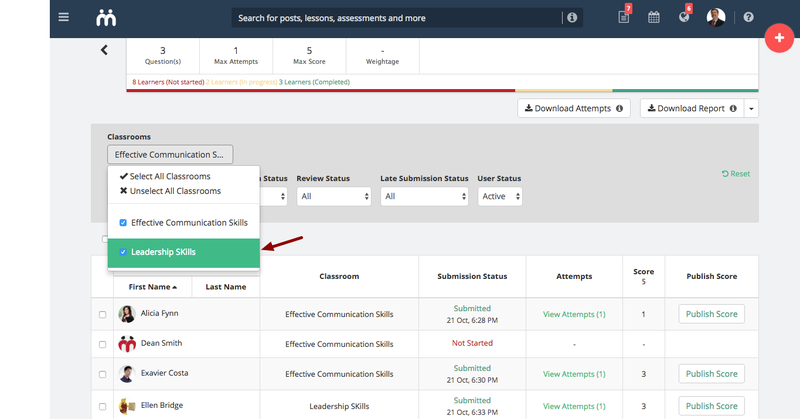 Once the mark is published, that learner would be able to see the marks (score) on the "View my attempts" page. 4. Click Unpublish Mark button to unpublish marks. 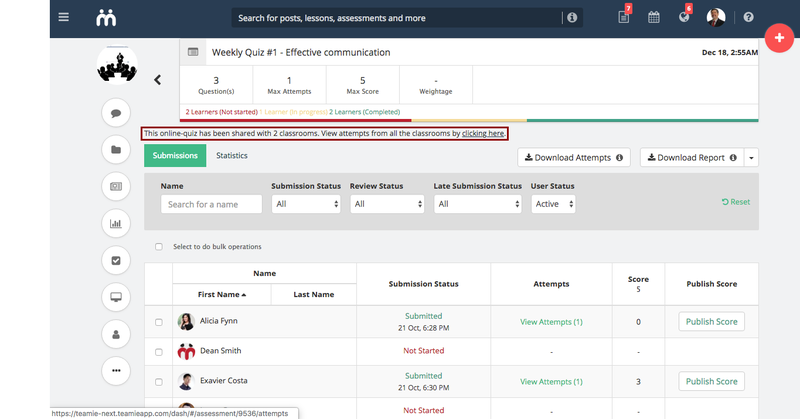 In case, an instructor has created a quiz and allowed learners to make multiple attempts (for example, learner can make up to 5 attempts) to the quiz. Now, let's assume, a learner made first three attempts and yet has the chance to make another two attempts. 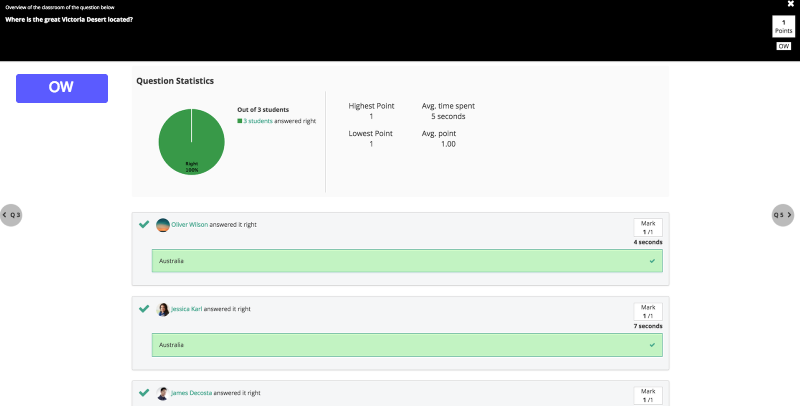 In the meantime, as an instructor, you have graded any of the learners attempt and published their marks, then learners will not be able to retake the quiz even when the maximum number of attempts value is not yet reached, because once marks are published, learners can not make any attempt. 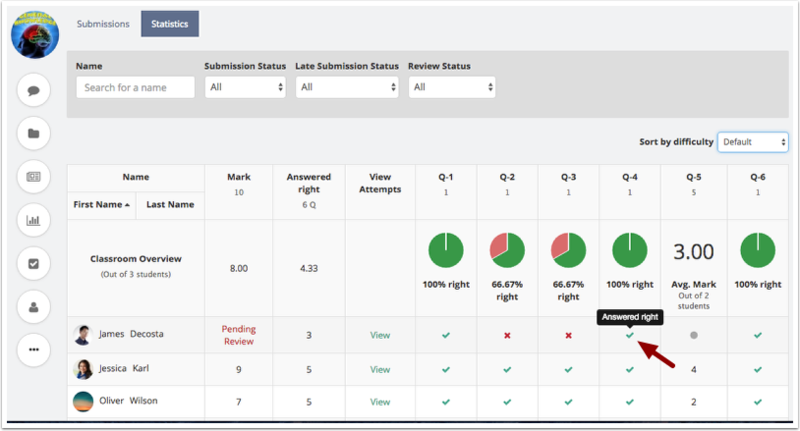 To allow learners to make another attempt, you may just grade learner's submission and also may add feedback on any of the attempt made so far, but you should not publish their marks. This will allow learners to retake the quiz after seeing instructor's feedback and then you may consider the recent attempt for final evaluation, grade it and publish mark. 3. 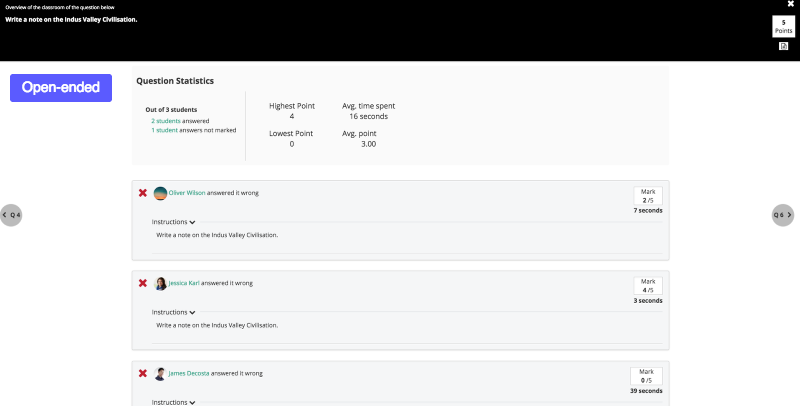 Selecting this checkbox will invoke the bulk operation actions like Publishing and Unpublishing marks, Publishing and Unpublishing feedback, Removing attempts and Sending reminder. 5. 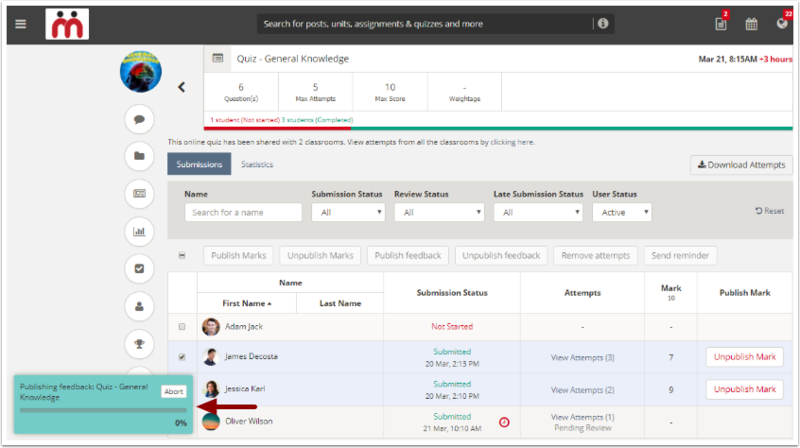 Select the learners whose marks to be published, then click Publish Marks button. 7. Clicking Yes, publish will initiate the marks publishing process. 8. A confirmation message appears stating that the marks have been published for the selected learners. 9. 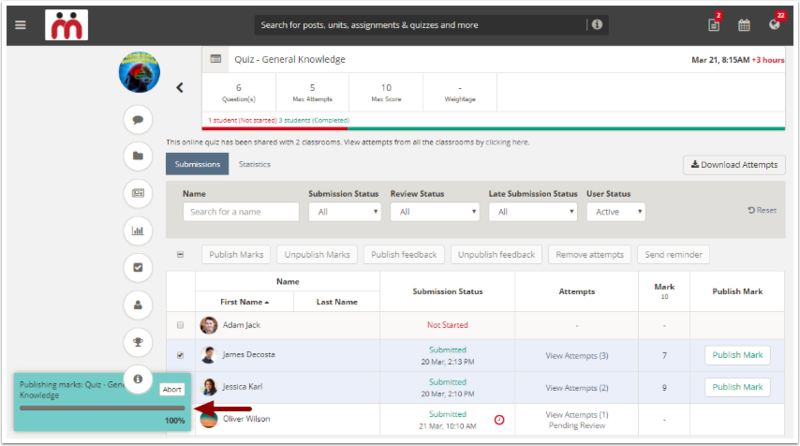 To unpublish the marks, select the learners, then click Unpublish marks button. 1. 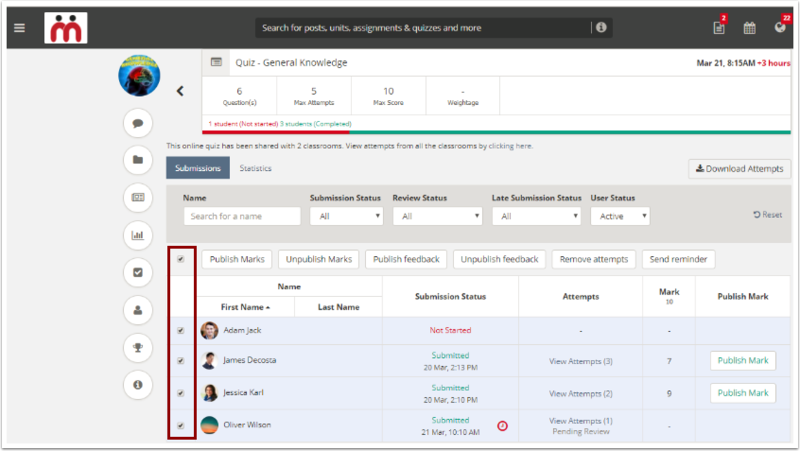 On the submissions listing page of the quiz, select the learners whose feedback needs to be published, then click the Publish feedback button. 1. On the submissions listing page of the quiz,, select the learners whose attempts you wish to remove and then click the Remove attempts button. In case, you wish to remove a single attempt of a learner, then read this article "Removing a single attempt of a learner" for more information. As an instructor, you may need to remind learner(s) sometime to make the submission to the quiz, if they have not yet started or have kept their submission in draft mode, before the deadline. However, as an instructor, you may have several other cases where you want to send an email to a group of learners regarding the submission even after they have made an attempt - a common one being the instructor requiring a particular group of learners to reattempt the quiz. So, you can do that too, i.e, send email to group of learners who have already made an attempt by using this feature. Let's see how to do this. 1. 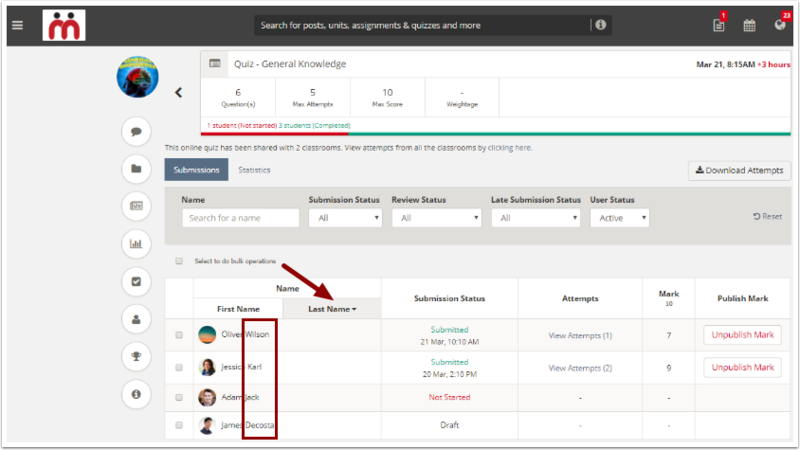 On the submissions listing page of the quiz, select the learner(s) who needs to be reminded and then click the Send reminder button. 3. 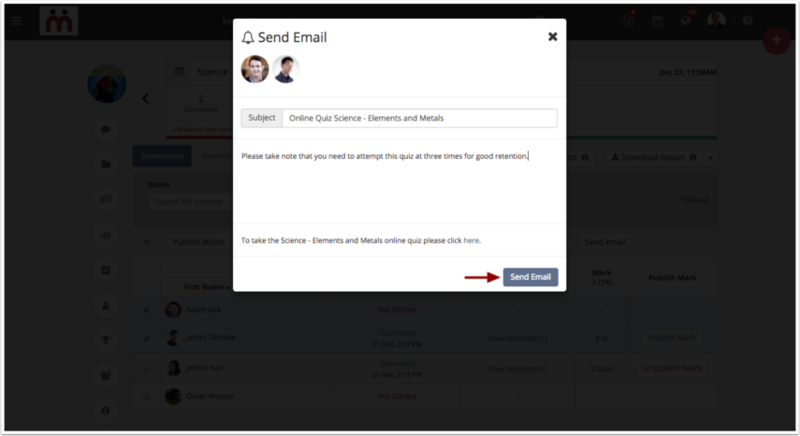 Click Send Email button to send the email for the selected learner(s). 1. 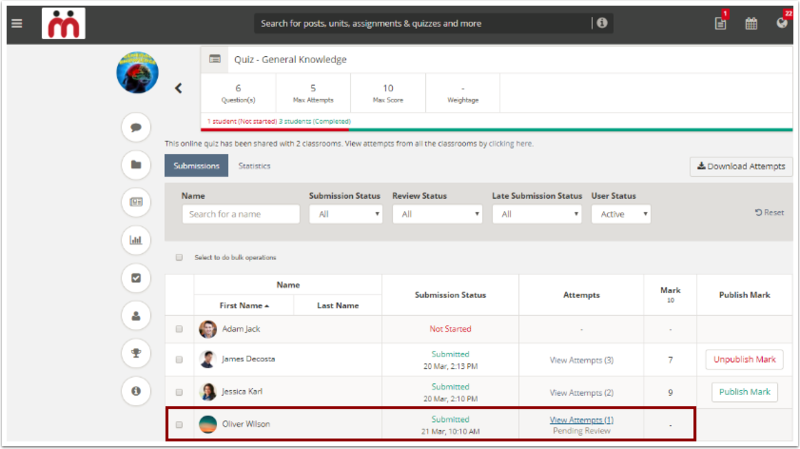 On the submissions listing page of the quiz, click Download Attempts button to download all the learners submissions. 2. Downloading submissions process starts. 3. Once the download submissions process is completed, you would be asked to save the .zip file in your local system. Click Save to save the file in a folder. 4. Once the .zip folder is downloaded, you may unzip it to view the submissions details of each learner. Click Show in folder to open the downloaded file. 5. In case, if a quiz is shared with multiple classrooms, then system will create thatmany folders after .zip is extracted. In this case, this quiz is shared with General knowledge and Physics classrooms, hence two separate folders are created for each classrooms to contain the submissions of each learner from respective classrooms. Navigate to the required folder to view learners submission. 6. Extracted folder will also download a consolidated file (PDF) having the submission details of all learners at one place. Open the submissions pdf file to view each learner's submission who have already made the submission to the quiz. The folders, created by learner's name will contain the file submissions made by the learners to the quiz. In case, no file submission is made by the learner, the folder will be empty. 7. System also downloads an excel file to show you the learner's stats at question level whether they got it right/ wrong, number of marks allotted for each question. Open the excel file to see the stats. 8. 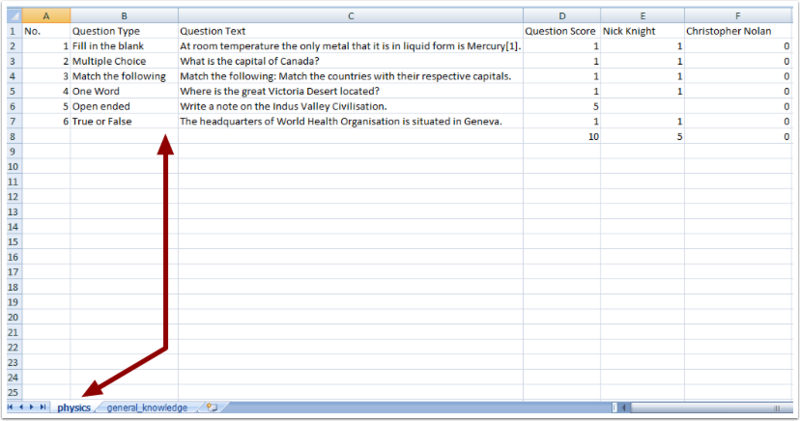 As this quiz was shared with two classrooms, this excel file has two sheets, named as General Knowledge and Physics. Here you can see the learner's stats at question level and total number of marks obtained by each learner. 9. 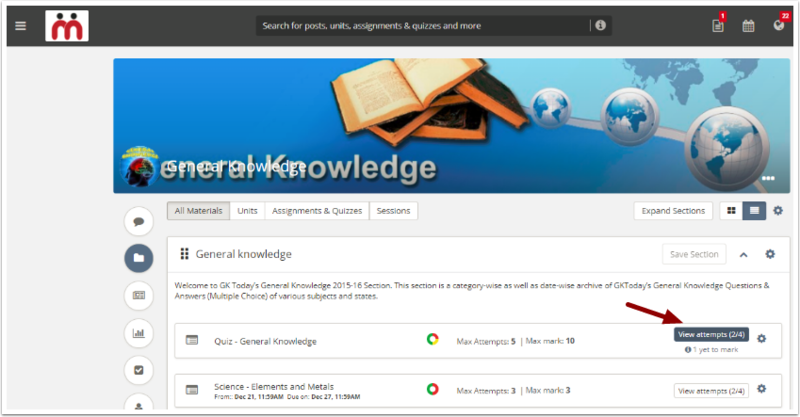 Click Physics sheet to view the learner's submission stats from the Physics classroom. As an instructor, you can apply a variety of filters on the view attempt page of a quiz. 1. By default, system shows all the learners along with their submission details, on the view attempts page of the quiz. 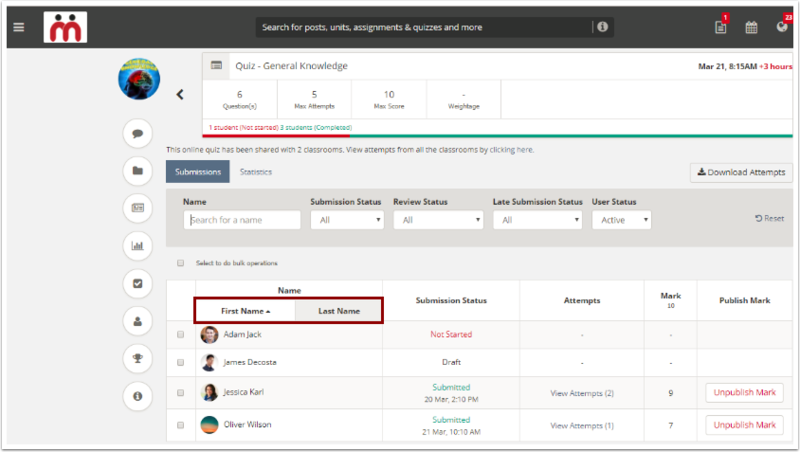 Click First Name filter to view learners list in descending order by their first name. Not started: Use this filter to see the list of learners who have not yet started making submission to the quiz. 6. 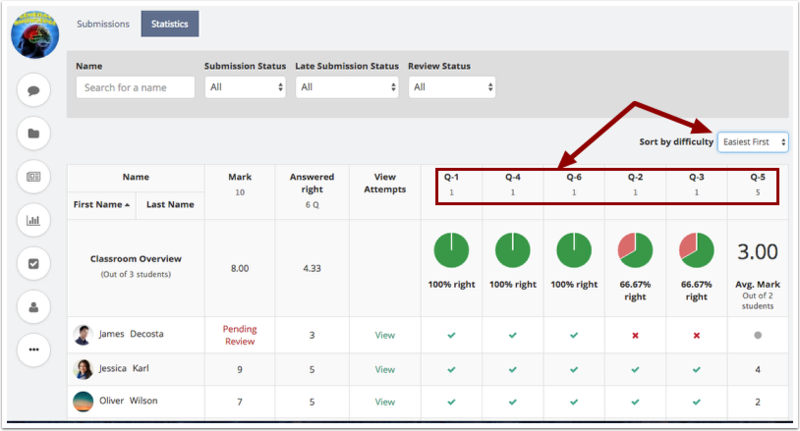 Click the Submission Status drop-down field and select Not Started filter to see the list of learners who have not yet started making submission to the quiz. 7. 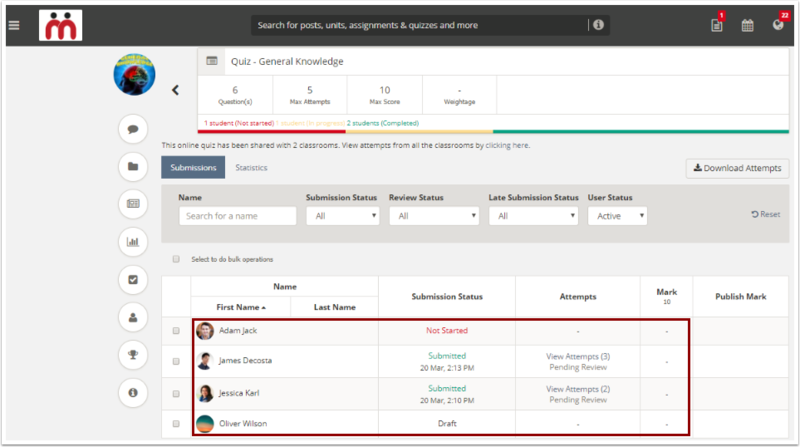 Click the Submission Status drop-down field and select Draft filter to see the list of learners who have started making submission and saved it as draft. 14. A block icon appears next to a learner's name indicating that the learner's access to this classroom has been blocked. 15. 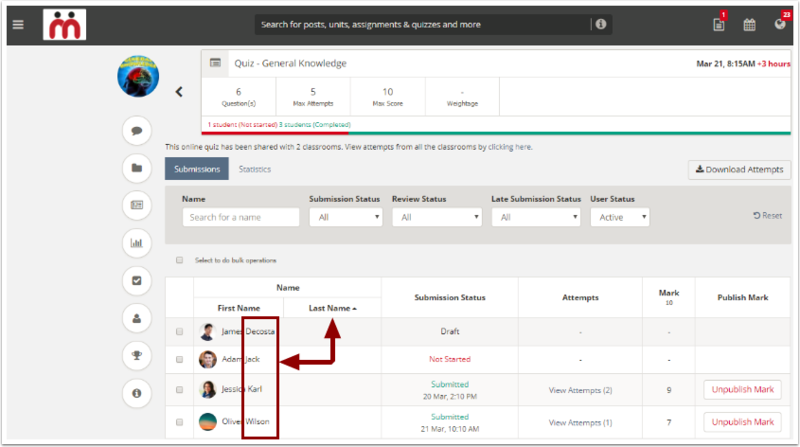 Click the User Status drop-down field and select Blocked filter to only see the list of learners who are in Blocked state. 1. Click View attempts button of the required quiz. 2. On the submissions listing page, you would see an instruction telling that "This online quiz has been shared with "number of" classrooms", View attempts from all the classrooms by clicking here, where clicking here is a hyperlinked text. Click the clicking here link to view attempts of learners from all the classrooms. 3. Now, you would see the list of learners from both the classrooms, the quiz is shared with, along with their submission status. 4. 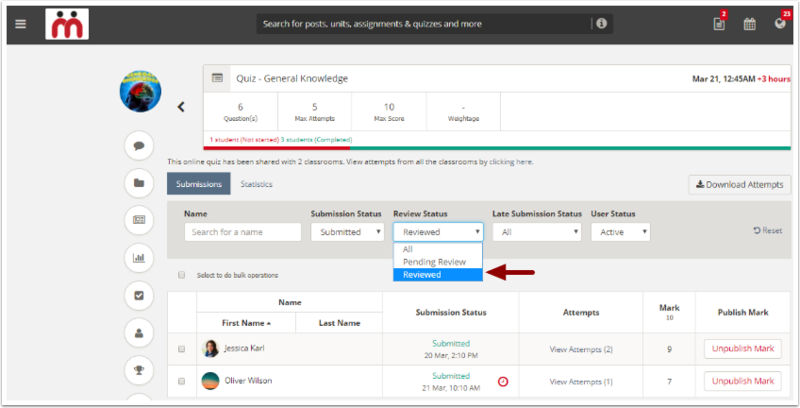 In case, you wish to view the list of learner's submission from a particular classroom, click the Classrooms drop-down field and refine your search by removing the classroom(s) whose submissions you don not wish to view by unticking it. In this case, we do not wish to see the learner's submission from Leadership Skills classroom.